Allied soft skinned vehicles have been very poorly represented in the modelling world beyond the manufacturers that produce usually resin models, these offering tend to be on the high end as regards cost and quite often require a high skill set to tackle with a reasonable level of success. Now ICM has come to the rescue of those modellers with a limited budget and a skill set from beginner to advanced modeller. Here we have a Fordson WOT 6 WW2 British Truck in 1/35th scale with the ICM approach to building a model with relative ease. The Fordson WOT 6 WW2 British Truck is a great choice by ICM as it can be presented in several different versions and I do look forward to a wrecker and maintenance versions in the future. This offering from ICM is packaged in the usual high standard that they have adopted and now always stick to. The result is that the model arrives in the way that ICM intended, my only complaint or more accurately concern is that the sprues being packed inside a single plastic bag does allow movement and so potential damage, and those kits with a lot of sprues could suffer from warping. In the case of this example I am pleased to say that the model has arrived in perfect condition and with all parts present with the exception of a break in one of the canvas frame supports. An examination of the contents leaves me finding nothing out of the ordinary. One thing that ICM tends to have a lot of are ejector pin marks and this offering is no different; I will say I was surprised to find proud rather than recessed pin marks on a good number of parts. Looking at the parts that are effected by ejector pin marks it is obvious to me that ICM are aware of the issue and done their best to hide this issue in unseen areas. Flow marks or stress marks depending on what you consider them are present in some locations but I did not find any that damaged the finish of the parts. My biggest surprise and pleasant surprise is the inclusion of photo etched parts in the box, something that I hope they continue to provide. Lastly there are some seam lines that will need to be addressed, primarily these are the ones on the leaf springs. As is typical with ICM there is an engine and transmission included with the kit and this one looks visually appealing. I tried to find images of the engine in or out of the vehicle and failed and so cannot comment on its accuracy. Some wires will need to be added to increase its appeal and realistic look. The exhaust will need to be drilled out at the end as it is solid on the sprue, this is not a difficult thing to do. I do like that ICM go to so much trouble with engines and a nice radiator in the this offering and most of their other offerings, but I wish they would think about displaying that the detail. The chassis of the model is a multi-part offering, something that is a double edged sword. I like the approach of a multi-part chassis from the point of accuracy and the detail that can be imparted that otherwise would not be possible. On the other side there is the issue of getting the assembly true as nothing is more frustrating than a central component that throws everything else out and makes the model all but un-buildable. As such this is one part of the model that you must get right, so take your time and clean up parts carefully. This vehicle being a four wheel drive offering means you have a transfer case, and I have to say I am surprised at how small it is on this model. The three shafts are present and you will need to take your time in locating the parts correctly. The axles have some nice detail provided. The leaf springs need some work to clean up the mould seams without damaging the provided detail. I do feel that ICM are one of the best companies when it comes to the greasy parts of a model that with the addition of some wire to replicate cables and pipes offers the model a huge potential. Looking at the front end of the model and ICM has still not looked into providing front wheels that can be finished in a turned position, something that I really do feel looks better than wheels that only point forwards. The fuel tanks will I feel need a little filler to hide the seams that will be present from being in two halves. Moving onto the tyres and a tread pattern that I do recognise, the tread pattern is the mud and snow pattern most commonly seen on US vehicles in the 1950’s; the pattern I am most familiar with is very similar to this but the pattern is angled rather than straight across. I do suspect that some will not like that they are vinyl offerings. The cab of the truck has a few spots where ejector pin marks will need to be tackled, but nothing that would overly test the modeller. The seating looks good but a little weathering to give them a lived in look would be an improvement in my opinion. The clear parts are very well done and that should not cause any distortion when looked through. A particularly nice touch in my opinion is the ridges on the back face of the steering wheel, a detail many will miss even though it adds such a nice touch in my opinion. The photo etched grills will I feel add a lot to the look of this model and it is really pleasing to see ICM dipping their toes. The wooden bed of the truck is excellent as regards detail. There is no wood texture present on the bed beyond the obvious planking, but there is a subtle texture present that should show well if carefully painted. There is of course a downside here and that is the ejector pin marks that will be a pig to get at on a lot of occasions and unfortunately this area has a lot of them that will need to be tackled. The rear mudguards are an area that has been tackled well and should look good. I am very pleased to see ICM supply the cage for the canvas on this offering that is correctly spaced at and will make adding a tissue canvas easy should you decide to. I am really pleased to see a British soft skin make it onto the market that is a truck rather than an artillery towing vehicle or the such, a soft skin in its own right. The issue here really comes down to the ejector pin marks of which there are quite a few. It is good to see ICM offering photo etched parts in their kits with this release and the supports for the canvas regardless of if you use one or not. The part I liked the most is the steering wheel with the ridges on the rear of it, a really nice touch. I have looked at images of the vehicles this model is based on and I could not find anything that was obviously wrong. In the belief that ICM is going to provide a line covering this vehicle I am really pleased and look forward to seeing what comes next. Darren Baker takes a look at the Fordson WOT 6 WW2 British Truck by ICM in 1/35th scale. Not all trucks were GS trucks & ICM don't claim this one to be so. Before ranting that ICM have got it wrong did you ever stop to think the machinery version was intended? Just because it doesn't fulfill your needs 100% don't spoil it for the rest. Attitudes like that will ultimately result in manufacturers walking away from what they perceive as an ungrateful bunch of moaners & we'd soon be back to no new British/Commonwealth softskins. This one suits me, and I suspect many others, fine Embrace diversity! Peter I gotta go with Simon and Darren on this one. If the manufacture is going to go with this particular prototype they either need to offer the full machine tool interior or at the very least a fully enclosed canvas top to hide the fact there is no workshop interior. The model looks very well done. I look forward to some after market provider rounding out the remainder of this kit. Actually, at one point years ago I even tried to convert the old Porte kit to make this truck but that enclosed cab construction just did not work out for me. p.s. ICM has chosen to intermix cab and frame parts with the rear body parts in their sprue layout. It is therefore unlikely that they plan a series of trucks based on this tooling. I'm with Simon, Daren and all the rest who comment the kits errors in general. I like to be informed and this is my right, if you prefer to live in the dark this is your right. And yes, the WOT8 kit body is machinery body and nothing else. Nothing to wonder ICM are silent, usually they don't know what they have done. For your information only, ICM are notorious with their bad research and up to date it leaded to a bunch of wrong softskin kits. I have no wish to support them with my money, or to stay silent in the name of the so-called "political correctness". Your attitude will lead to even more wrong kits for sure, and they are enough around, not necessary by ICM only. Also, when I'll feel the urge to embrace diversity, I'll most probably switch to Modelcollect walking tanks. But when it comes to a kit of a subject that really existed, I prefer to see it as it was in the real life. In this case, WOT6 with empty GS body, or WOT6 machinery body with equipment. End of the rant. 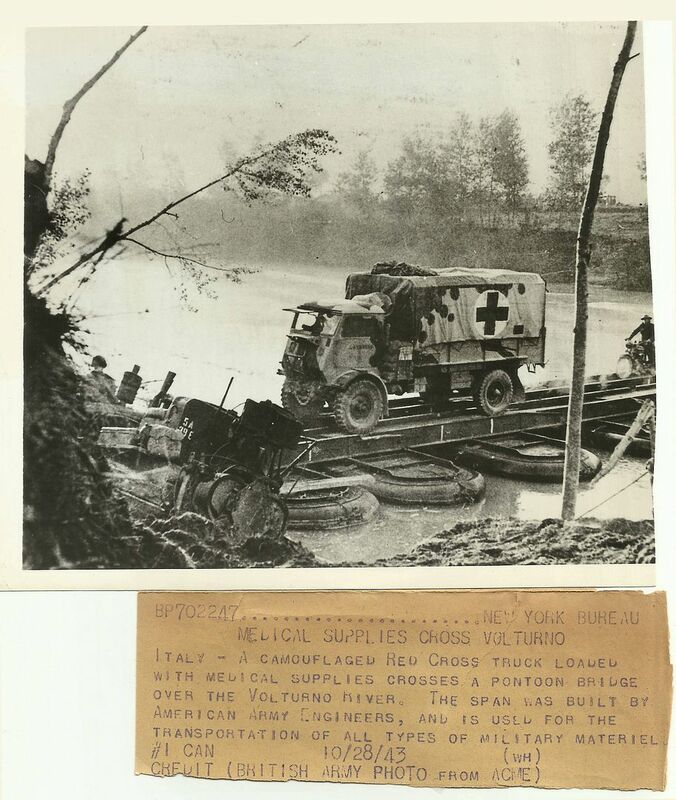 @ Michael Koenig: That medical lorry passing Volturno is WOT8. Ilian I am in agreement with you on the question of accuracy but please help the rest of us out who are trying to learn the body types. You say that the truck I show is a WOT8 - does that translate into that being a General Service style body???? (Yes, my intent was to show a General Service body in the photograph.) Is there an online guide you could send us to that would define these body types for us???? Hi Michael, The difference is that WOT8 is 1.5-tonner (30cwt in British class nomenclature) and WOT6 is 3-tonner, the wheelbase of the latter is longer (143,5 inches against 118 inches of WOT8). The designations have nothing to do with the body types. 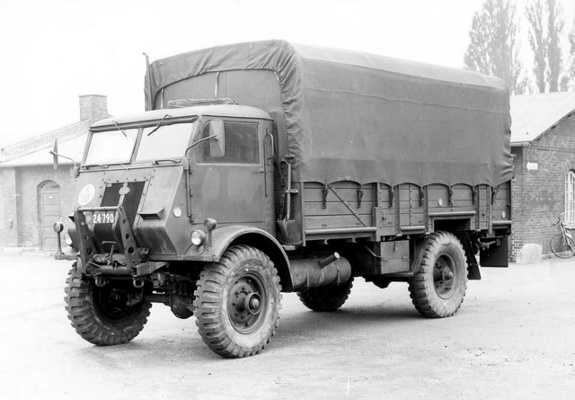 With WOT8 it is easy, all they were GS trucks ("general service"). The Russians converted some received by Lend-Lease to rocket launchers but now we're talking about their British use. With WOT6 the situation with the bodies isn't that simple but I'll try, for I'm not aware of any online help on the subject. The GS body was most used, perhaps. It has simple side boards and only the tailgate was dropable. There are several "Machinery Lorry" types on WOT6 chassis but they are externally the same and differ in the equipment only, save the single van type machinery body. The open machinery body was similar to GS body but still different in many details, it is also longer. It has dropable side boards and they have also a foldable section, to form additional bench when dropped (with two vices each side permanently fixed there). Only the central section of the tailgate was dropable, to form an access door with ladder attached. These two bodies are most important here, in the ICM kit context. There were also another bodies fitted to WOT6, here is the list (by Mike Conniford): Some of them are illustrated on this compilation I made specially for you: Note also where is the fuel tank on the GS truck and where it is on the rest chassis. Probably it is worth to mention here also that the future WOT8 of ICM, as seen on the 3D render in their 2019 catalog, isn't correct, being fitted with WOT6 cab. It differs in some details and it is quite obvious but it seems this also escapes the ICM "researchers". HTH Cheers!